Colorado gubernatorial candidate George Brauchler took to Twitter yesterday to blame Obamacare for steep increases in the cost of health insurance purchased from Colorado’s health insurance exchange. “Thank you, #Obamacare,” tweeted Brauchler, a Republican, citing a Denver Post article. The Post piece reported that U.S. Rep. Mike Coffman, U.S. Sen. Cory Gardner, and U.S. Rep. Scott Tipton, all Republicans, also blamed Obamacare for the rate increase. Salazar said insurers told regulators that the ongoing debate over whether to repeal the Affordable Care Act — and, essentially, change the rules for the individual market only a few years after the rules were first rewritten by the law, also known as Obamacare — led in part to the price increases. Insurers also cited more general market conditions in filings with the state justifying the proposed premiums. Obviously, we don’t know what “general market conditions” contributed to the rate increases–or to what extent they were related to Obamacare. Though we do know that health insurance prices were increasing prior to Obamacare as well. And we know Republicans have so far chosen not to try to fix problems with Obamacare. But it’s clearly a ludicrous overreach for Republicans to blame insurance increases on Obama’s health care law, after we just witnessed the spectacular crash of the GOP’s seven-year crusade to repeal Obamacare. I can’t tell ya how excited I was to read, “Is Medicaid Gobbling Up Colorado’s Budget,” in The Denver Post, and reporter John Ingold did not let me down. The piece provides a sober look at the repeated Republican allegation, documented multiple times on this blog, that if not for Democrat-led healthcare spending on children, elderly, disabled, and other poor people, there would be no budget crisis and the pavers would likely be doing their thing on every street corner. Killing Obamacare won’t free up money for roads, schools, or other wish-list spending. We already knew this, but Ingold nails the door to the crazyhouse shut by finding out from Henry Sobanet, Hick’s budget director, that the small percentage of Colorado dollars that pay for Obamacare, also called the Medicaid expansion, can’t be used for general budget expenses. “We could cancel the expansion, and we wouldn’t save a dollar in the general fund,” Sobanet told Ingold. But something tells me, if I turn on the radio this morning, I’ll still hear a conservative blaming Obamacare for Colorado’s budget crisis. And if you cut non-disabled people from Medicaid, you’re left with the collateral social costs of dealing with the lives you’ve blown up, not to mention the weight on your conscience from your decision to reject this group of people, who mostly the working poor. Colorado’s Medicaid costs are increasing, but actual-factual ways to bring down costs look to be cruel and illusive. Who are the “able-bodied” adults whom conservatives want to kick off Medicaid? I’ll write more about this later, but it turns out, in short, able-bodied Medicaid recipients are truly poor people, most of whom are actually working. In fact, 75 percent of the adults who got health insurance under Obamacare, about 400,000 in Colorado, who make up a sizable chunk of the “able-bodied” Medicaid group, are working. For a single adult, to be eligible for Obamacare’s Medicaid expansion, you have to earn less than $16,00. For a family of four, it’s about $32,000. Bottom line: This article should help fact-conscious politicians have more informed debates about Medicaid spending in Colorado. And it should help stop the stomach-turning scapegoating of low-income people that we hear from conservatives. If you’re a progressive, you can criticize the ultra-conservative Centennial Institute for a lot of things, like being homophobic, Islamophobic, and more, but being scared of a open debate is one thing the organization is not. Centennial Institute founder, John Andrews, began the tradition of inviting questions and discussion, and the current director, Jeff Hunt, is carrying it on. And Hunt has put no restrictions on his questions. Contrast that with approach taken by the conservative billionaires, Charles and David Koch, when they held a big shindig in Colorado Springs last month of Republican politicians and donors associated with the Kochs’ Seminar Network. As they’ve done in the past, the Kochs set ground rules for reporters, whom they invited to cover the event. One rule prohibited journalists from reporting on who was there, unless they were part of a formal program or the attendee gave permission to a reporter, according to Bunch. In other words, the presence of a person was off the record, unless permission was given or they were on the program. Judging from the reaction to similar, if not identical, restrictions imposed by the Kochs at other gatherings, journalists differ on whether the benefits of attending such events, even with the restrictions, outweighs the downsides. I’d rather have a partially muzzled reporter in the room with the Kochs than none, but journalists who attend such events should inform us that restrictions were placed on their reporting, as outlets such as USA Today and the Washington Post have done in the past. But I couldn’t find any reference to media restrictions in the coverage of last month’s Colorado Springs Koch event, including in reporting by the Associated Press, Denver Post, NBC News, Politico, and others. Emails to the Associated Press, Denver Post, and Politico were not immediately returned. I’ll update this post if I they respond. In any case, I wouldn’t expect the Centennial Institute to try to do this, especially at a gathering of 4,000 people, of course, but at any forum. Hunt says there are not restrictions on journalists. They even let Samantha Bee loose at last year’s Summit. And Hunt’s choice of a journalist to interview gubernatorial candidates at its upcoming Summit is along the same lines of openness to honest debate. At the Summit, each Colorado gubernatorial candidate will be allowed a five-minute speech, and Bunch will ask ten minutes of questions to the group. Attendees will have the opportunity to vote on their favorite candidate, just as they did among vice presidential hopefuls last year, choosing former U.S. House Speaker Newt Gingrich. The results will be announced later. Among the Republican candidates, 18th Judicial District Attorney George Brauchler and businessmen Victor Mitchell and Doug Robinson accepted invitations to attend so far. The only Democrat to respond is U.S. Rep. Ed Perlmutter, who’s declined. Why did Hunt pick Bunch to do the interview segment of the program? But Hunt wouldn’t put just any journalist on the stage. That’s why he’s glad Trump is fighting reporters. Hunt doesn’t accuse all journalists as being unfair. He said the Denver weekly Westword is one of the “fairest newspapers” he’s dealt with so far in Colorado. He also likes 9News anchor Kyle Clark, Denver Post Editor of the Editorial Pages Chuck Plunkett, and others. Conservatives should give journalists (mainstream, left, or right) a chance and not initially look at media outlets as if they are “out to get me,” Hunt said. As the media world implodes, that’s also good advice for progressives or anyone. Since then, Portman and Capito have added a measure of definition to this vague statement by endorsing a seven-year phaseout of Obama’s Medicaid expansion, which provided over 400,00 Coloradans with health insurance. Portman called it a “glide path” that would gradually reduce federal Medicaid funding to the states beginning in 2020. But Murkowski and Gardner are refusing to discuss their current thinking on the Medicaid expansion. The Hill asked Murkowski twice last week if she’d agree to a gradual phaseout, and she declined to say. In May, Gardner declined to answer a direct question from The Denver Post’s Mark Matthews about whether he supports the plan, in the Obamacare replacement bill passed by the House, to begin the Medicaid-expansion phaseout in 2020. In the absence of more details from Gardner, journalists are on solid ground reporting that Gardner is on board with ending the Obamacare Medicaid program that covers over 400,000 Coloradans. The only question is the time frame, the number of years in the glide path. During the 2014 campaign, and ever since the first Ryan budget introduced a partial privatization of Medicare, the often repeated message from Gardner was that making dramatic cuts to health programs was a way to protect them for future generations. These sort of policy justifications can make sense within their own inverted logic, but the plain meaning of the words are likely lost on the average voter. Journalists have the burden of making sure the facts are presented alongside the spin. UPDATE: CNN looked at the front pages of 10 newspapers across the country, including The Denver Post and the New York Times. Eight out of ten featured the Comey story above the fold in the print edition. The Manchester Union-Leader joined The Post in not doing so. I’m still the kind of person who compares The Denver Post to the New York Times. Today, the major headline in the Times’ print edition reads, “Trump appealed to Comey to halt inquiry of Flynn.” It occupies two columns on the upper right portion of the front page, where the most important headlines of the day are placed. The Post’s upper right-hand headline, in contrast, states, “Judge orders inmate freed,” not an insignificant story but paltry compared to the Trump story, which has rocked the White House, the stock market, and even Republicans. And The Post’s headline, “Trump pressed Comey to drop Flynn Probe,” filled just one column of the print edition’s front page, in the lower right hand corner, “below the fold,” as newspaper readers like to say. A glance at The Post’s front page makes you think of hail, since that’s the dominant story, not the possible downfall of the president. I know The Post likes to emphasize local news on its front page–as well as stories that the whole world hasn’t already heard about by the time they receive their dead-tree newspaper in the morning. And, of course, the Times broke the Comey story, so might expect some hype. But if the story was hyped, it deserved it, for obvious reasons that, apparently, The Post didn’t understand, at least as of yesterday. I’m hoping they’ll do better as this story inevitably unfolds. Reporters covering the weeds of the gubernatorial race should note that GOP candidate George Brauchler is contradicting himself about how he’ll try to access the ballot. He told The Denver Post he’d rely solely on the decision of delegates at the State Republican convention, while telling a conservative radio host he’d leave open the possibility of getting on the ballot via the petition process that upended the senatorial campaign of former state Rep. Jon Keyser (R-CO Springs). This is the second time in two weeks of campaigning that Brauchler has made conflicting statements to The Post and talk-radio hosts. Contradicting a 2015 statement he made to The Post, Brauchler claimed last week on air that he was on juror away from securing the death penalty in the Aurora-shooting case, when, in fact, he was three votes away. Positioning himself as one of the more conservative candidates in the race, Brauchler said he plans to seek a slot on the primary ballot through a nomination at the Republican Party’s convention, rather than collect petition signatures to qualify. Kaminsky–One interesting thing, you have said that you plan to get your position on the primary ballot by going to the convention rather than getting signatures. This is a little bit of insider baseball, but I think it says something about you as a candidate, as well. Can you explain, please? Brauchler–And I’ll say this: I haven’t publicly foreclosed the possibility of petition. But honestly – and this is the way I got to be District Attorney – I’m invested in the grassroots aspect of getting elected. I think we have reached a place with campaign-finance and social media where you can have people who have the means — either their own or through third-party efforts — to simply bypass the individual, face-to-face requirements of going out and earning votes. You just show up on TV, show up on the Internet, you put things into people’s mailboxes. Now, we’re going to do all those things. But at the end of the day, there’s only one process to get on the ballot that guarantees you are going to get around the state and do retail politics, to press the flesh, look people in the fac,e and answer their questions about who you are and what’s important to them. And so, I’m invested in really trying to look hard at how we’re going to accomplish getting on the ballot through the assembly process. But I haven’t foreclosed any other options. He hadn’t publicly foreclosed the petition option? That’s not how I read The Post interview, which hasn’t been corrected. 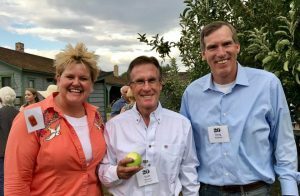 Frank was correct that, for Brauchler, relying on Colorado’s State Republican convention would be a “political gamble”–which is probably why the Arapahoe County District Attorney thought twice about it. The outcome of convention is predictably unpredictable, as demonstrated the jaw-bouncing decision of Republicans there last year to hand the GOP senatorial nomination to Darryl Glenn, who went on to lose to Democratic U.S. Sen. Michael Bennet. Well-heeled candidates like Brauchler usually try to access the ballot via both the convention and petition routes, giving them a backup if they get Glenned, so to speak. Colorado State Sen. Tim Neville (R-Littleton) eschewed the petition process and watched his U.S. Senate dreams die when he was upset by Glenn at the convention last year. Brauchler wants to avoid Neville’s fate. But the state convention is the stronghold of the GOP’s grassroots contingent, whose support is critical to winning the Republican nomination, even in an open primary–even more so this year because Trump seems to have energized and emboldened Colorado Republicans. So, by initially saying he’d skip the petition process Brauchler was sending a love note to GOP grassroots activists. But it turns out Brauchler isn’t ready to commit to the marriage. Honestly, I don’t blame him. They can be so difficult and hard to live with. The panel, titled Getting to Truth in the Age of Alternative Facts, was held to mark “Sunshine Week,” which promotes openness in government. The event was organized by the Colorado Freedom of Information Coalition, and it was hosted by 9News. Panelists offered varied takes on fake-news issue, ranging from, “It’s all in the eye of the beholder,” according to State Sen. Tim Neville (R-Littleton), to, “It’s become incredibly cliche; it’s an easy way out for people to attack us,” according to Denver7 investigator Tony Kovaleski. “What I want to strive to do is, yes, point it out when I think journalists get it wrong, but be quicker to applaud all those times when they do a great job, which is most of the time,” said Armstrong. Also on the panel was Bob Steele of the Poynter Institute in Tampa Florida, Linda Shapley, managing editor of The Denver Post, Luis Toro, director of Colorado Ethics Watch, Anastasiya Bolton, a reporter at 9NEWS. Watch the entire panel discussion here. You’ll definitely enjoy it. Are Colorado Republicans really guaranteeing that people who have health insurance now will continue to have it under an Obamacare replacement? “The answer to that is no, right?” asked Hayes. Colorado Republicans need to be asked the same question, because over the past months they’ve repeatedly implied that no one will lose their health insurance if Obamacare is repealed. But am I hearing them right? Is this a promise? If nothing means nothing, then no one will lose their health care coverage, at a minimum, much less all the other benefits of Obamacare (e.g., coverage for under-26 family members, pre-existing conditions, no caps on coverage). Coffman’s office sort of confirmed his stance to 9News this week. 9News: Coffman’s office told us he wants to keep the changes Obamacare made for pre-existing conditions, the ability for parents to keep children on their plans until age 26, and maintaining coverage for people who gained it under the ACA—including the Medicaid expansion, which has been criticized by some of Coffman’s fellow Republicans. But that’s a aspiration, not a promise, and Coffman’s constituents want to know if Coffman would vote for a still-unkown Obamacare replacement that would throw people off the health insurance rolls. U.S. Sen. Cory Gardner (R-CO) expressed the same promise in the form of an aspiration, as he likes to do when dealing with a tough question. Gardner: “What we have to do is create a bipartisan health care plan, health insurance plan, to make sure that we can do better than Obamacare,” said Gardner on KOA 850-AM Jan. 13. In some communications, Colorado Republicans are stopping short of promising that their constituents won’t lose their health insurance, but they’re guaranteeing that elements of Obamacare won’t be lost. “…[U]nder the Republican replacement plans, no individual with a pre-existing condition will be denied insurance coverage or see their rates spike,” wrote Congressman Ken Buck, Doug Lamborn, and Scott Tipton in The Denver Post Jan. 13. But the larger question remains. What exactly are you saying? Will you vote for a bill that doesn’t guarantee health insurance for all Americans who have it under Obamacare? If not, how many are you willing to throw off the rolls or put at risk of losing their coverage? You are currently browsing the archives for the Denver Post category.